VFMS PTO works hard to fund programs that enrich the educational experience of all VFMS students. Thanks to our generous supporters, we are able to raise funds in a variety of ways. The Vice President for Fundraising is Tereza Keohane. If you would like to become involved in fundraising, you can contact Tereza through our contact form and selecting VP of Fundraising. Our Direct Donation Program provides a way for supporters to make a direct cash contribution to the PTO. We’ve learned that many families appreciate this simple approach that avoids the time and effort that go with traditional fundraisers such as wrapping paper sales. To make a Direct Donation, visit our Donations page or mail in this form along with your check. All donations are tax deductible. Throughout the school year, the PTO holds several social events that raise funds for the PTO and offer an opportunity for socializing. The Spirit Store is the new online store of the VFMS PTO. Sales through the Spirit Store raise money for VFMS PTO. The store will be open soon. When you shop on AmazonSmile, 0.5% of your purchase price can come back to the VFMS PTO. Prior to making your first purchase on AmazonSmile, follow this link: http://smile.amazon.com/ch/23-2936863 to designate the VFMS PTO as your charitable organization. You only need to designate your charity the first time. Bookmark this link to use for future purchase or make sure you use http://smile.amazon.com rather than the regular amazon website for your purchase to count. Click here to learn more about the AmazonSmile fundraiser. The PTO collects Box Tops for Education to raise money for PTO activities. The collection box is located in the main office throughout the school year. You can participate by clipping the official Box Top for Education from the box and sending it to VFMS with your student. 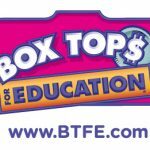 The PTO receives 10 cents for each Box Top. The PTO Box Tops for Education coordinator for the 2017-18 school year is Brookie White.